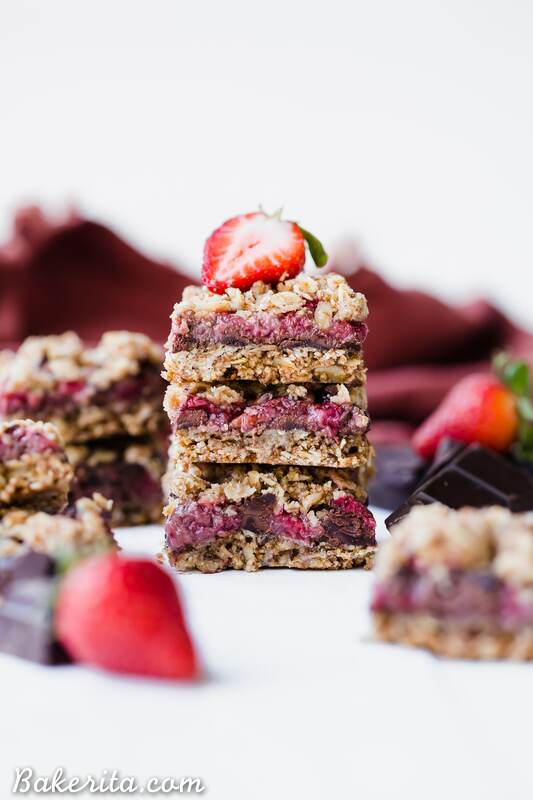 These Strawberry Chocolate Chunk Oatmeal Bars have an oatmeal cookie crust and crumble, filled with fresh strawberries and dark chocolate chunks – it makes for an irresistibly delicious treat! These oatmeal bars are gluten-free, refined sugar-free, and vegan. Here in San Diego (and hopefully in most of the country by now! ), we’re well into Spring. The sun shines brightly all day long, leaving the sky illuminated with the most beautiful sunsets, the final light trickling off around 8 pm. My plants are loving it, with new growth sprouting all over the place and making everything feel more alive. The farmer’s markets are showing all signs of spring too – beautiful flowers in every color of the rainbow, leafy greens galore, with bunches of asparagus lining the booths. My fave part though? You guessed it – the STRAWBERRIES. They’re juicy and vibrant, with a bright red color. They tend to be smaller than grocery store strawberries, and so much sweeter. Their smaller size packs in all of the flavor, and when I’m not eating them plain, they’re begging to be incorporated into baked goods. 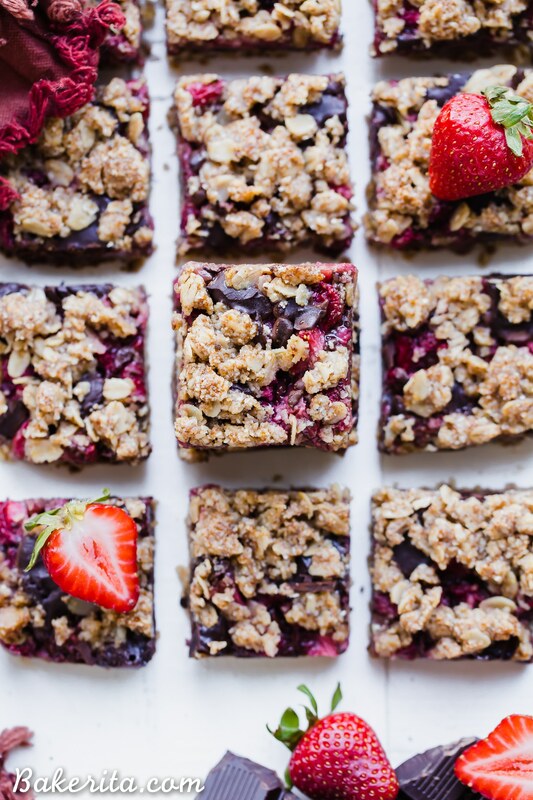 Since strawberries and dark chocolate are a natural pair, the choice to put them together came easily for these oatmeal bars. They turned out just as deliciously as I imagined they would – it’s truly hard to go wrong with chocolate and strawberries! They’re easy to make too, since the crust and crumble are one in the same! No need to make two doughs here because the crust does double duty. A little more than half of the crumble mixture is pressed into the pan and baked. Once it’s baked, the dark chocolate chunks and strawberries are piled on top, and then sprinkled with the remaining crumble mixture. It’s all baked until it’s golden brown and the strawberries are softened. The hardest part is simply waiting for them to cool! I put mine in the fridge to put me out of my waiting misery and stop me from picking at the crumble topping – it’s a bad habit. Once the bars are nice and chilled, they’re way easier to cut…and to eat! The oatmeal crust and crumble provide the perfect amount of texture, which is complemented by the freshness of the bright and sweet strawberries and the richness of the dark chocolate. 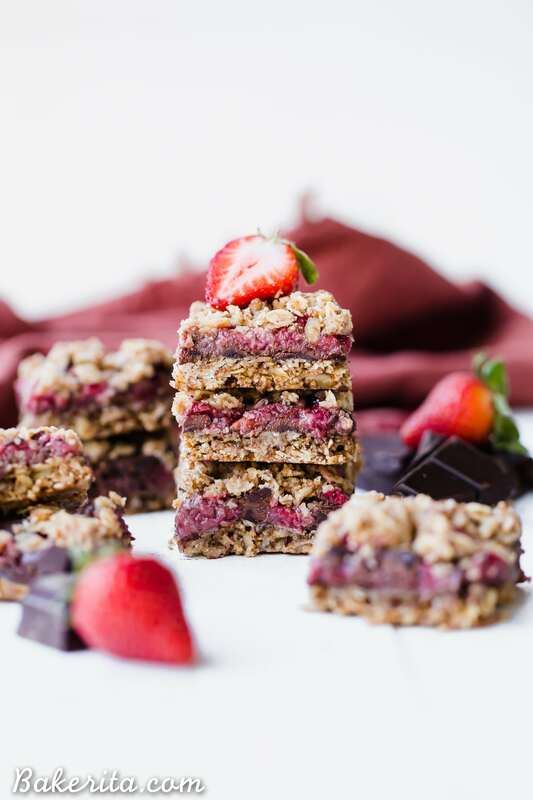 You are certainly going to want to give these Strawberry Chocolate Chunk Oatmeal Bars a try while strawberries are so. dang. good. Enjoy!! 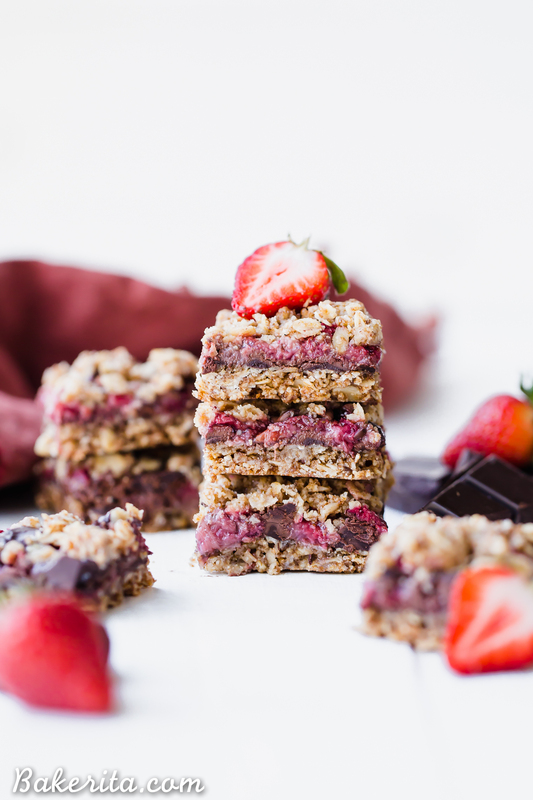 These Strawberry Chocolate Chunk Oatmeal Bars have an oatmeal cookie crust and crumble, filled with fresh strawberries and dark chocolate chunks - it makes for an irresistibly delicious treat! These oatmeal bars are gluten-free, refined sugar-free, and vegan. In a medium bowl, toss together strawberries and tapioca starch. Let stand while you prepare the crust. In large bowl, combine the rest of the ingredients except the chocolate chunks. Stir until combined. Remove partially baked crust from the oven. Sprinkle chocolate over the crust. Evenly distribute strawberries on top (leave any liquid that’s collected in the bottom of the bowl). Top with remaining crumb mixture. Return to oven and bake for another 30-35 minutes or until bubbling and lightly browned. Let cool completely before cutting into 16 squares. I really like chocolate and strawberries so much,I just can’t wait to make some now!!!! Thanks so much Rocky, hope you love them! I just found your website and it looks like even I may be able to duplicate some of your recipes. I saw the lemon macaroons could be made in advance and frozen. 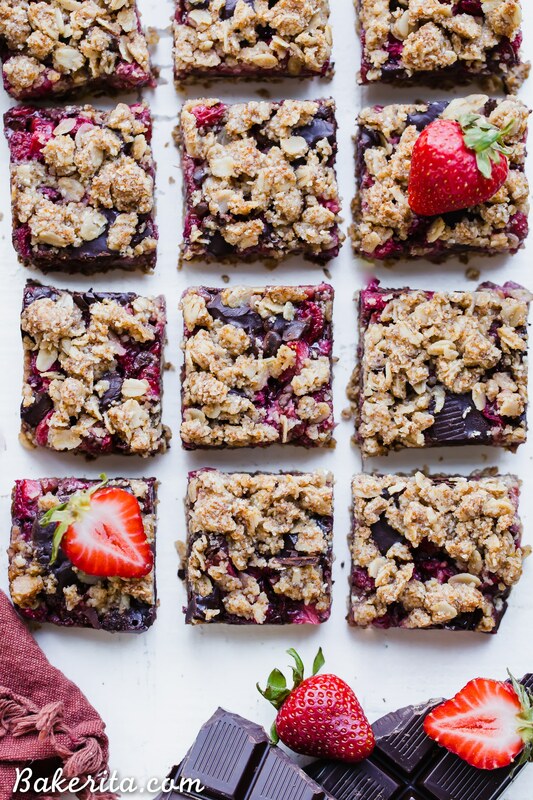 Do you think these strawberry dark chocolate oatmeal bars could be made a few weeks in advance too? Would need to freeze since it’s June here in Ohio. Also, to thaw out either – what is your suggestion?